Exciting, clever, spacious and fast, are words never spoken about micro-cars. In fact, I’d go one further and say the outgoing Spark was appalling. The first few years of its miserable existence were spent with a manual gearbox most of its target group didn’t know how to use. The interior was nasty with cheap poorly designed plakky parts. The performance could most kindly be described as meagre and the comfort was, well, absent. Similarly, the exterior styling was slab-like and dull with a faint hint of last century lingering about the build quality. The less said about it the better. The words “Out damn spot”, come to mind. Europeans have known the advantages of small and micro cars for decades. The formula is simple: small exterior, small engine, small fuel bill and small purchase price, inexpensive, but not cheap. Australia just doesn’t get it. The exterior isn’t as different from the old car as I would like, but then there isn’t much metal to work with. Chief designer, Mike Simcoe, described the character lines as providing shadows and points of interest. He also explained that designing a new headlight costs a million bucks, per headlight (“that’s expensive to replace”, I quipped). 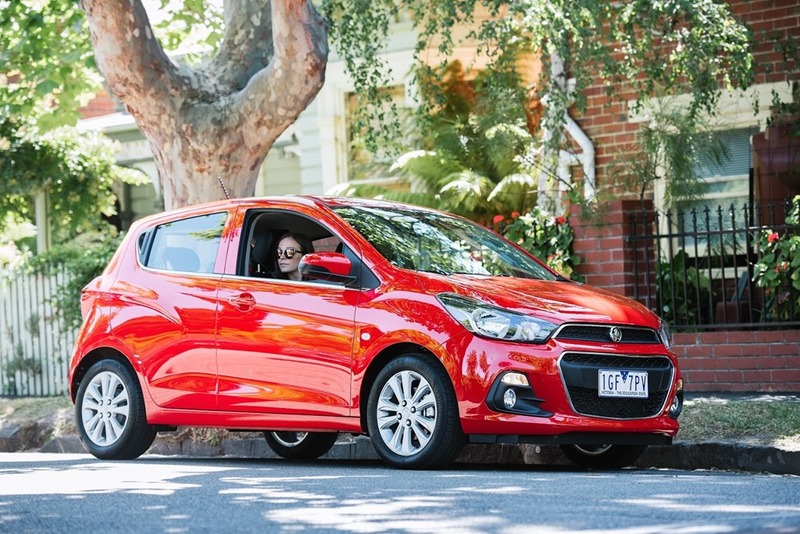 This explains why there isn’t a different face for each and every market, and the Spark has a similar feeling to the rest of the Holden range. The body coloured bar across the middle of the grille makes the lower section look a bit heavy, and the top section a trifle insignificant. Holden have made a decent fist of the headlights which have a sculptural hi-tech look. They have internal features which add interest even when not illuminated. There are 2 models, LS and LT. The LS has either a 5 speed (yes 5 speed) manual or a CVT. The LT comes in CVT only, and scores a nice set of alloys. The standard steel wheels and hubcaps on the LS look a bit low-rent for my liking. Holden says the side profile has a hint of coupe with the rear doors having concealed door handles. 4 doors appeal to the “millennial” target market. Yes, I hadn’t heard the term millennial either. 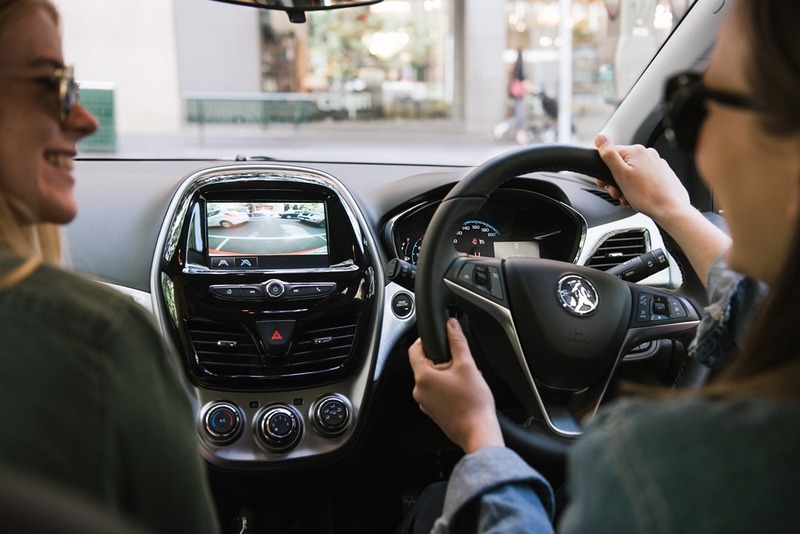 I’m told by Holden marketing that it is those born after Gen Y, and shortly before 2000. The age range tops out at around 26-ish. 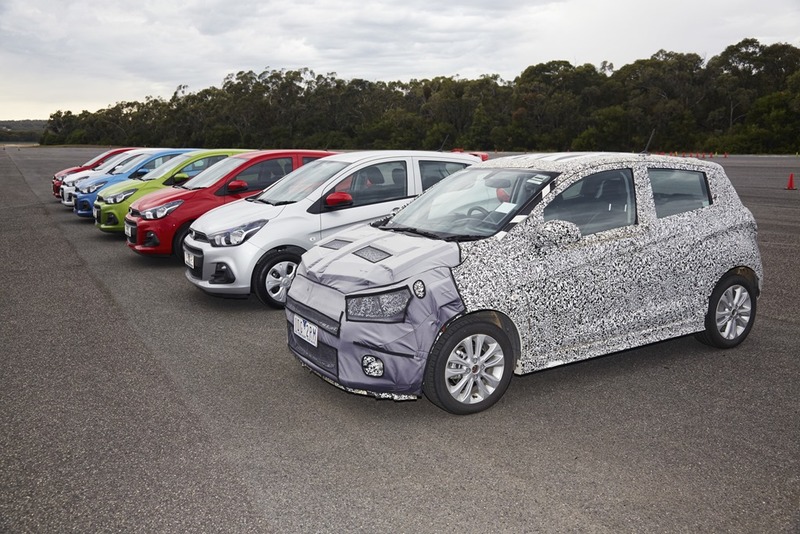 Holden says coupes, IE 3 door hatches, don’t sell well. I’m learning new things all the time it seems. 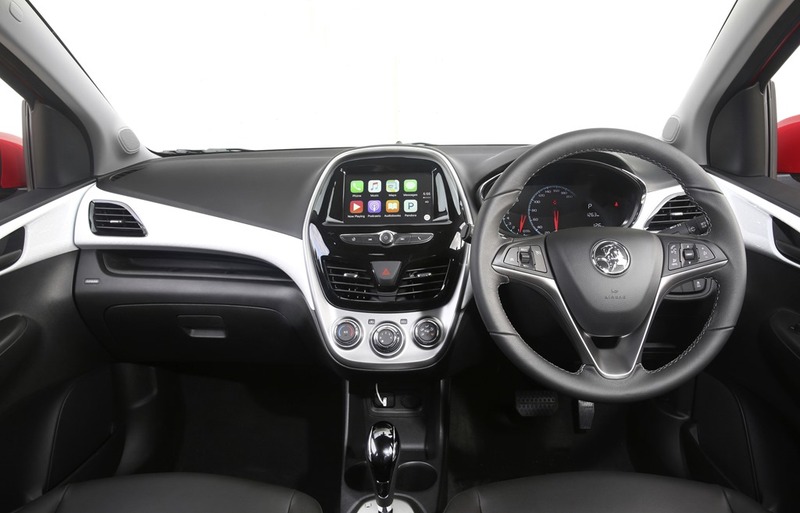 Holden made much of their infotainment system which features Apple Car Play. You plug your Iphone into it and many of the features are mirrored on the screen including maps, music, messages etc. It will allow some 3rd party apps like Spotify to stream music through the internet. 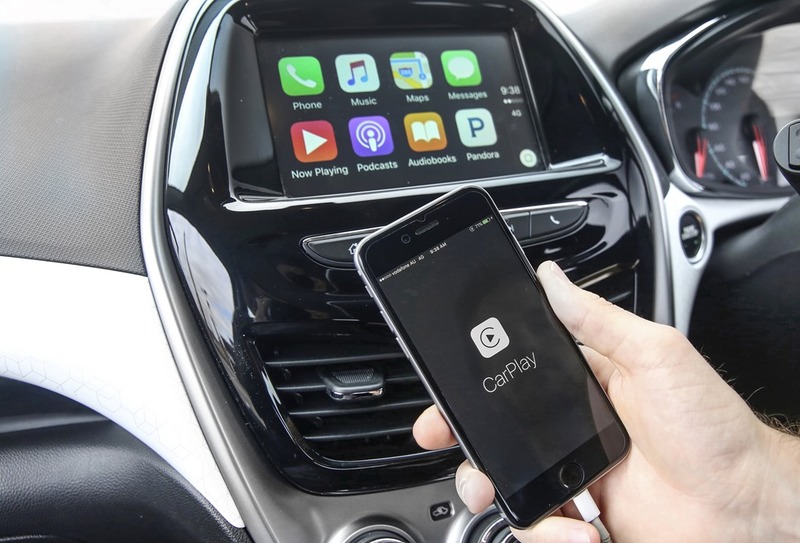 Carplay allows Siri to connect the driver to the car, and the car to the world. That’s an awful lot of connecting. For example, if you want the car to take you home, you press the voice button, and ask Siri. Siri will open “Maps” and bobs-your-uncle, the map pops up on the screen and the directions begin. You swipe the screen like you do your phone, which allows you treat the car exactly like you treat your phone. There is no need to pair your phone as the system is wired only. Because you have to be physically plugged in, security isn’t a problem. Once plugged in, there is a little shelf under the console for your phone. They’ve thought of everything. The one small fly in the ointment is Siri’s need to be connected to the network. No network, no Siri. That means no streaming music, no texts, no maps and no voice system. Other than that, it’s happy days. Oh, and it also works with other mobile OS systems. 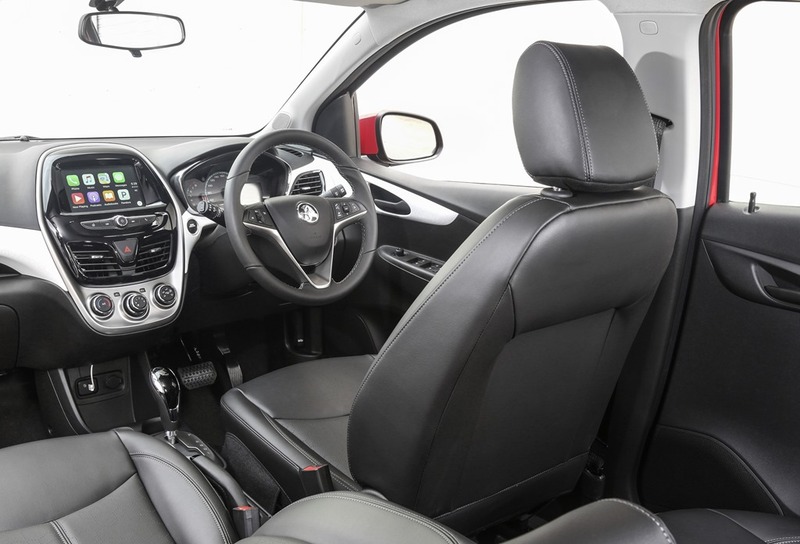 The cabin is reasonable quality for an entry level car. It seats 4 in relative comfort, 5 if you’re all midgets. The small boot easily passes the “2 small bags“test”. 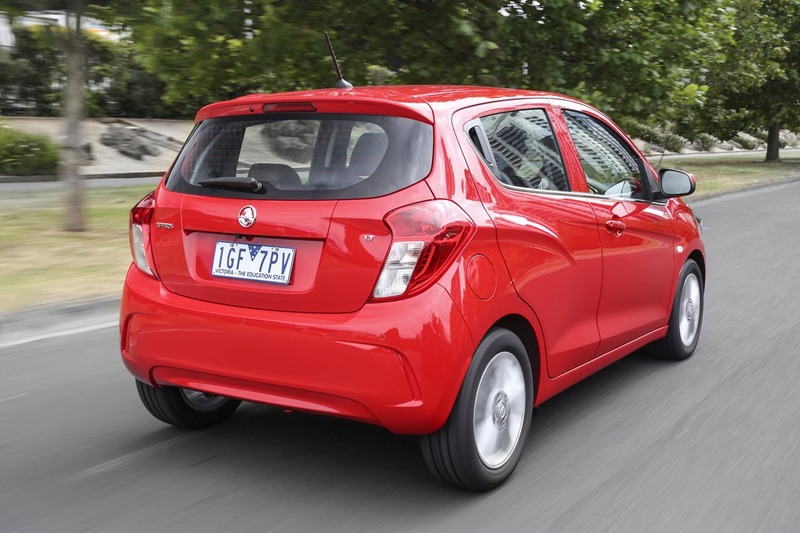 Holden claims Spark will “reset the benchmark” which seems a bit boasty-pants to me. 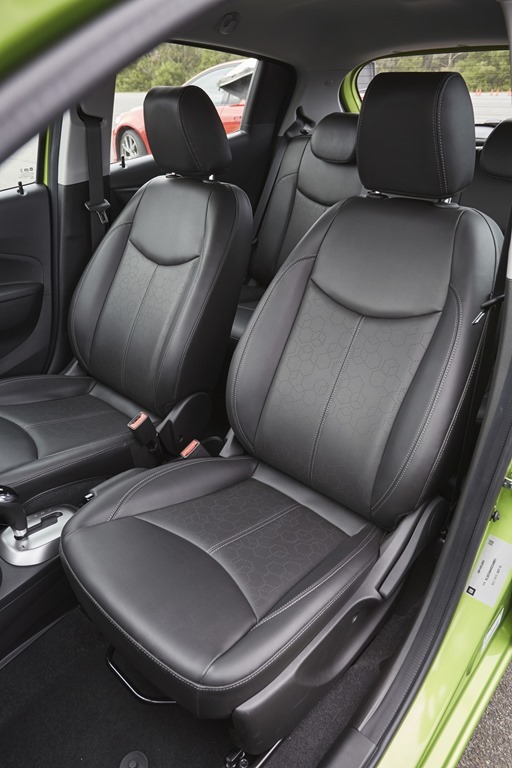 It is good, sure, but the seats squabs are a bit small and don’t provide enough support for a taller occupant. Having said that, it is a city car and will be used for city travel. The execs said “we don’t want the car to be a reason you don’t do something” meaning apart from carrying something that won’t fit into it, you can do everything else. The dash is neat and uses GM’s “double cockpit” design. There are two lines scooping in to the middle from each side of the car. The console centre stack has A/C controls, a vent, and some auxiliary buttons for the largest-in-class 7” LCD screen. There are 3 A/C knobs, and buttons for on/off, home, phone answer, and back and forward. That’s it, unless you want to count the hazard flashers. Both models get power windows and mirrors, and the LT adds reverse camera and rear parking assist, keyless smart start, and white interior highlights which may well get interchangeable panels later. This brings us to the drive. I was excited, not because we were going to drive the Spark, but because we were going to drive the Spark at Lang Lang. Lang Lang is a speck of dust about an hour and a half south-east of Melbourne and is the site of Holden’s famous top-secret test facility. It is like Fight Club and you can’t talk about it. It is called The Proving Ground. Holden is so potty about secrecy, that our phones, cameras, and tablets had tape placed over the camera lenses. 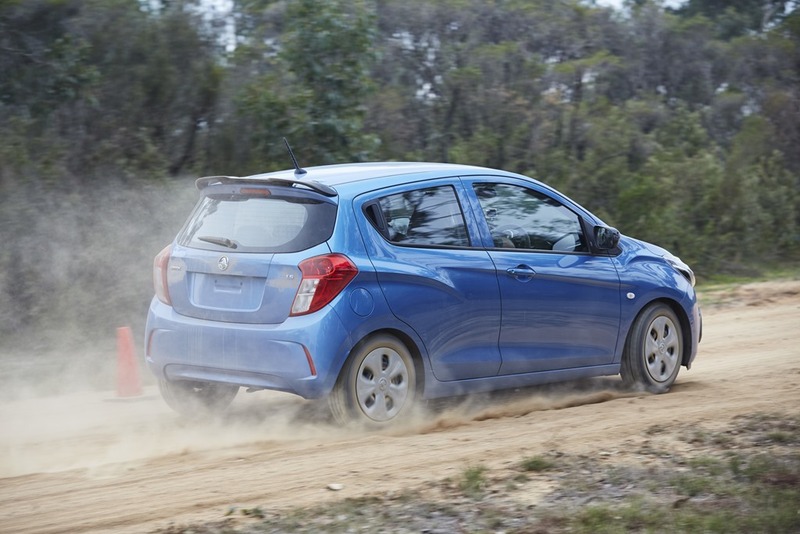 The Proving Ground, or PG for short, is where every Holden since Captain Cook has been developed and tested. There are a series of tracks, roads, obstacles, and terrains which simulate some of the worst terrain Australia can produce. It is so punishing, that some components are tested to destruction. Many of the tracks and roads have been used in Holden ads. A recent one had Commodores being filmed on the famous circular banked track. The banked track is one of the few places in the country where you can start your car, put it in gear and glue your Manalo to the Axminster and leave it there until you run out of fuel. There are no corners, no bends, no straights, no traffic and no obstacles apart from the odd roo. Roos will play havoc with your paintwork so our minders did their best to keep the fauna out of harms way. 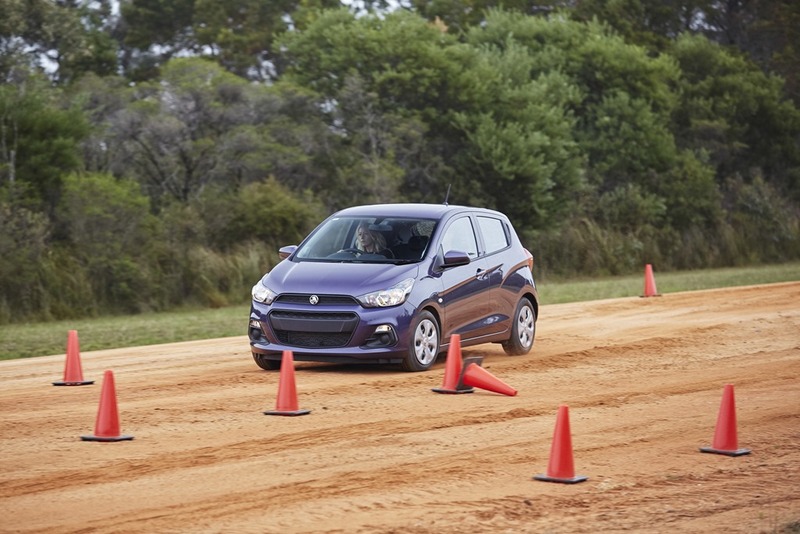 We didn’t get to use the banked track but we did get to use the skid pan, a gravel road, and a simulated country road. I want to go into this in some detail to show how brilliant the Spark really was. I told Holden’s Sean Poppitt that taking us to Lang Lang in Sparks was insane. “You’ll be right” he said. Those words were no comfort, none whatever. Melbourne is moody weather-wise, everyone knows that. Our drive day was positively uncooperative. Victoria sulked soporifically the whole day, making the roads treacherously moist. Our first task was on the skid pan. We were to do a slalom, in reverse, with our mirrors taped over. After a few practice runs, we tackled a timed round. It was a doddle. I was surprised at how easy it was given I had never done it before. Next was the gravel road. This saw us tackle another slalom, a 180° handbrake turn, then the slalom back to where we started. Again, after only the briefest of briefings, we were like old-hands. Here we were, in a tiny city car, flinging it around a track like it was a toy. We had experts on board of course, but it was what we call in the industry, a hoot. No Sparks were harmed in the writing of this story. Finally, a a circuit of hills, dips, corners, straights and a hairpin on the slipperiest tarmac I’ve ever encountered. Victoria hasn’t had a lot of rain and is horribly brown. This means the road hasn’t had a proper rinse to take away buildup. These conditions would rarely be met outside Lang Lang PG, but the Spark was an absolute champ. Despite a few tail waggles, there were no incidents. 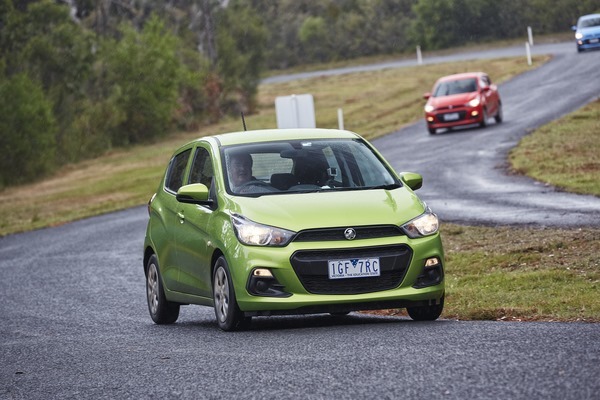 The 90-minute road loop through Victorian countryside cemented my opinion of the new Spark. You expect me to say it was a dreary miserable box of mediocrity, but not a bit of it. The mini Holden performed flawlessly. Every claim made at the presentation the evening before turned out to be true. The nightmare of the old model faded to be filled with fun and enthusiasm. It was comfortable and quiet and handled my co-driver’s unbridled passion. He was quite a bit more eager than my good self, but even thehumble CVT did very well. The CVT is behaves like a normal CVT until high speed, hard acceleration, or sports performance is needed. It then adopts a “stepped” profile sounding more like a normal auto transmission. But, it isn’t all good news. The manual is a 5 speed, a cog short of the industry standard of 6. Then there is the price. The LS manual has an acceptable RRP of $13,990, but the CVT is $15,690. The CVT-only LT is a rather startling $18,990. You’ll need to add on roads which will make the top model around 20 grand drive away. 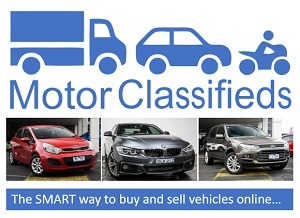 For $20,000 you have options such as: Elantra SE auto, Lancer Sport CF auto, Fiat 500 Pop auto, Ford EcoSport Ambiente auto, and VW Polo Comfortline auto to name but a few (source: carsales.com.au new car search correct at the time of writing). I like Spark a lot. I like it as much as I loathed its predecessor. I liked the lively steering, sharp brakes and large-car ride which was smooth even in CVT form. It is small, so is easy to use in the city. The fuel figures of 5.2 manual, and 5.5 L/100k for the CVT is respectable. For some obscure reason the CVT has the same 73kw of the manual, but has at 128Nm vs 124Nm for the manual. We did ask why this was. The answer was to do with the way the transmissions handle torque etc. I was only 4Nm and sounded odd, but there it is. It is a micro car best suited to smaller people for whom it would be a perfect fit. Would I buy 1? Yes, but only after test driving other brands, keeping an eye on value for money. Subaru do, or Scooby Do?